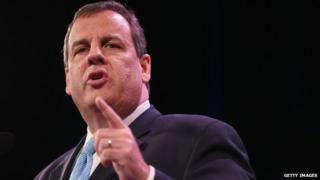 New Jersey's Governor and Republican presidential hopeful Chris Christie is to begin his three-day visit to the UK. But it is also seen as a chance to boost his foreign policy credentials ahead of the 2016 White House race. Although the elections are still more than 18 months away, rival Republican contenders are currently trying to ensure they have enough donors to fund their campaigns, the BBC's Naomi Grimley in Washington reports. Governor Christie is yet to officially announce a White House bid. "One of the main objectives of this trip is to focus on the opportunities that exist between the United Kingdom and New Jersey and our country as a whole," Governor Christie told reporters ahead of the visit. Mr Christie emerged as a Republican frontrunner after he gained praise for his emergency response to Hurricane Sandy in 2012, our correspondent says. But she adds that his reputation took a hit last year when it was alleged his aides had intentionally caused traffic chaos on a New Jersey bridge, just to spite another politician. On Friday, Mitt Romney, the Republican beaten by President Barack Obama in the US 2012 election, announced that he would not run for president again. The move frees up donors to support other Republican candidates. Former Florida Governor Jeb Bush and Senator Rand Paul are among those who are considering a White House bid. On the Democratic side, the presumed front-runner is former Secretary of State Hillary Clinton, although she has not made any announcement about campaigning. Mrs Clinton previously sought the Democratic nomination in 2008, but lost out to Barack Obama. Romney 2016: The 'definition of insanity'?